achievements for some years, I can talk of a band with perseverance at following their musical roots and ideals and consistance in creation. Silencing Machine, the band's may be the most intense, well-balanced record in Nachtmystium's discography. It's heavy as lead, majestetic as night. Surely it can bear its title with pride. Conceptual writing and reflection is in place this time too. Originality talking, this release shows a new face of Nachtmystium, more settled in their art than ever. Nachtmystium's Golden Age may have come with this release. 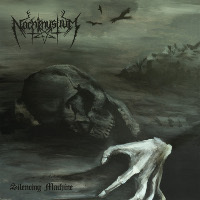 Through Silencing Machine, Nachtmystium show the meaning of their name. NB: World tour with Aborted, Napalm Death, Marduk starting now!